Are you a Halloween fan? Are you ready? Me? 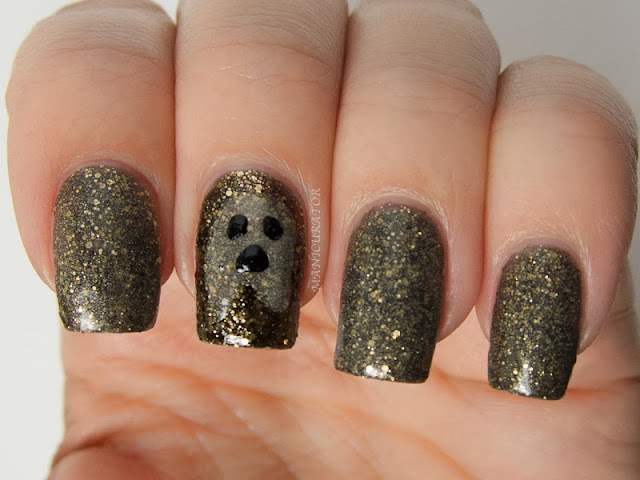 Let's just say it's not my favorite holiday and I tend to not get excited about Halloween nail looks. 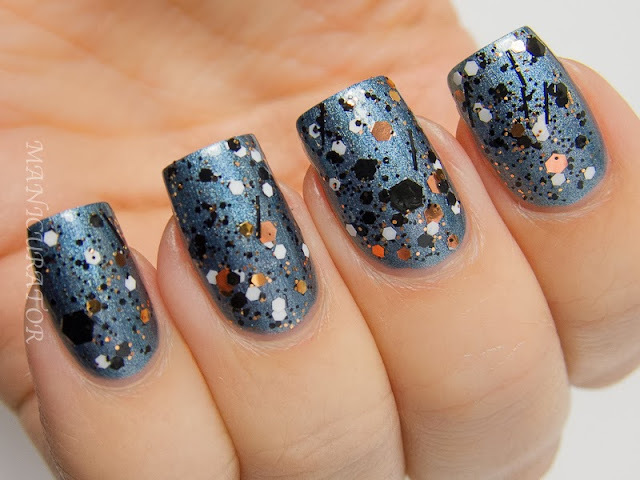 I was happy to review this China Glaze Limited Edition Monsters Ball Halloween 2013 collection for you, but I wasn't expecting to like it. (Surprise! I do!) These are available now, October 2013 at fine salons and beauty supply stores. For more information, please visit www.chinaglaze.com or follow China Glaze on Facebook (@ChinaGlaze), Twitter (@ChinaGlazeOfficial), Instagram (@ChinaGlazeOfficial), Pinterest (pinterest.com/chinaglaze) and YouTube (youtube.com/chinaglazeofficial). China Glaze Monsters Ball Howl You Doin' - A "shadowy purple glitter" is a good way to describe this one. 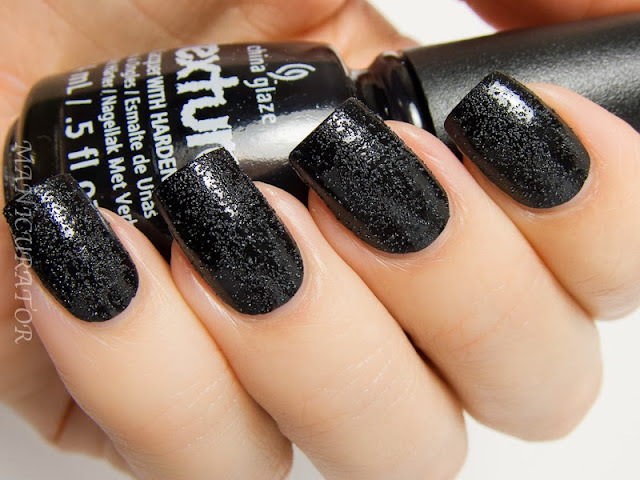 I needed 3 coats for full opacity here, but the formula was good and application wasn't difficult. I think it's a perfectly Halloweeny shade. China Glaze Monsters Ball Bat My Eyes - "Ominous gold glitter". This one surprised me as it was opaque in 2 coats and I really liked it. With as many glitters that I have, this one managed to be unique! It's packed full with glitter, so the only issue is it may show up a little lumpy. A thick top coat will help a lot there. China Glaze Monsters Ball Bat My Eyes with Ghoulish Glow and Bump in the Night. 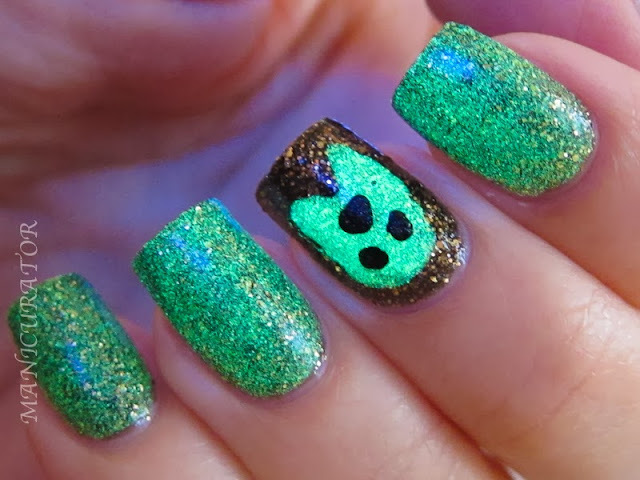 Here you can see Ghoulish Glow glows in the dark!! How fun! I used Bump in the Night for the eyes and mouth of my ghost friend. ;) One coat was plenty for this look. China Glaze Monsters Ball Fang-Tastic over China Glaze Sci-Fly By. An interesting look of green, blue and magenta glitters. I have one coat over 2 coats of Sci-Fly By. China Glaze Monsters Ball Boo-Gie Down over 2 coats China Glaze Take A Trek. I used one coat here and love this look, I think the orange takes on a copper feel and that makes this one unique. Well, that's the collection! What do you think? Which is your favorite? Do you have fun with Halloween? I'll be taking my twins trick-or-treating this year as a blue crayon and a green crayon (their choice!) Stay safe and enjoy! This CG collection is simply amazing! Love your nail swatches! They are so creative and fun!